I have recently started using HLT and am really struggling to work it out. I have tried reading the docs, but they seem to mostly be for older versions and for the life of me, I cannot work out the logic of the app :-/ I am sure if you wrote it, or have used it a lot, it all makes sense, but to me, I can barely find the same thing twice in a row because I cannot follow the logic of where it is. Anyway, let's assume I am being daft - so please can you help?! As background, I do sprint racing, which means there is no traditional lap, which adds some complication. I am using a GoPro 5 for video only, so iPhone camera not in use. I did get that connected and controlled by HLT for my laps. I tried loading a track map, which partially worked, as it was detected and tried to make laps, but of course, start and stop is all wrong and now I have 23 partial laps instead of 7 sprint races. I recently did a sprint at Blyton Park in the UK, and seem to have data, lap lists and video (not all talking to each other!). 1) Edit and/or create Sprint Track POI's from original track layout so it keeps the original POI's for corners etc, but I replace start and stop with Standing Start Go and Stop in different places instead. 2) Create new Sprint Track POI's where no existing track exists - preferably just on a map so I can place corners etc. 4) Export these sprints with video and overlay so I can share via YT or wherever. This sprint race means you are on a regular circuit but have a standing start somewhere and the finish line elsewhere? It will be easiest to load the existing track set first. Then, change the start/stop trigger to a standing start trigger (Lap List ‣ your track ‣ Certified Track Set) by changing the trigger type. Once the type is changed, use the Map icon to transition to the trigger's position in Map View. Drag the standing start trigger to the correct position. To drag, touch the trigger with your finger, wait a second, and start moving. Next, create a Stop trigger: center the map over the position the finish trigger should go and press "+" / New Trigger. Fill in the full spec, driving direction when passing the finish line in particular. Make sure the POI Set is the track you are working on. In case you want to create a sprint "track" somewhere else (no existing track set), simply use LapTimer ‣ Prepare Race ‣ Autocross. Thanks Harry - appreciate your answers. That may help with some of the challenges, but raises separate questions. 1) If it's an existing track, can it be copied to make a new version? I want to do this, as I may still do track days there, as well as the sprints, and would like to be able to choose between the normal circuit and the sprint circuit, which is the same apart from the start and finish lines. 2) Can I create the sprint track remotely (i.e. I am not at the track), as the Autocross option wants you to be on site to set the co-ordinates? 3) I still don't know how to export my last session with the complete data and video set for each lap. How can I do this, as it breaks it down to non-existent laps This is basically a combination of questions 3 and 4 above. Hi Harry - thank you for coming back to me. Firstly, thank you for the reply - it answers somethings, but raises other questions. 2) If I want to 'create' a track, can I do it remotely, i.e. not at the track itself? When I tried the Autocross option, it wanted me to walk to the start finish etc. 1)+2) I think I have described the steps to create a copy of an existing track set in my first answer. In case you want to go deeper into this topic, please read the Trigger documentation on www.gps-laptimer.de/documentation. There is a somewhat outdated tutorial on how to define track set off site available too. In case your configuration is used regularly (and not just a personal choice), we can add this configuration to the certified list too. Please send a sketch and other information to Tracks@gps-laptimer.de in this case. 3) Export the full track day to .VBO and import that file again once you have you Sprint configuration set up. VBO exports represent a continuous logging without lap splits. So once you import it (by touching the attachment exported to a mail), LapTimer will apply its track recognition routines (with track sets loaded currently) again. Harry wrote: 1)+2) I think I have described the steps to create a copy of an existing track set in my first answer. In case you want to go deeper into this topic, please read the Trigger documentation on http://www.gps-laptimer.de/documentation. There is a somewhat outdated tutorial on how to define track set off site available too. In case your configuration is used regularly (and not just a personal choice), we can add this configuration to the certified list too. Please send a sketch and other information to Tracks@gps-laptimer.de in this case. You described how to load a track and modify it, but not how to save it as a new track, so how do I do that? I thought it overwrote the one I loaded? It is a track many of us use in a Sprint series, so happy to add it to the list. What does the sketch need to include? Harry wrote: 3) Export the full track day to .VBO and import that file again once you have you Sprint configuration set up. VBO exports represent a continuous logging without lap splits. So once you import it (by touching the attachment exported to a mail), LapTimer will apply its track recognition routines (with track sets loaded currently) again. Sorry to be daft, but I actually need to know how to do these things, not just to understand the general steps For example, how do I export to .VBO? Then when loading, do I just load the new track set ( which I have somehow saved from the previous step ) and the click the attachment whic will reload with new configuration? PS - did warn you I was a newbie, so please bear with me as I get to know your product. I have tried what you suggested, edited the track and then re-imported the VBO, but it's not overlaying any data on the video any more, only the logo, the date etc (which is now today's date, not the date of the race). I didn't get any reply to the last entry, but am truly lost now. Please can you (or anyone else!) help? 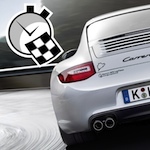 For the track configuration your want to add, please contact Tracks@gps-laptimer.de as written above. VBO files do not include the date, so any re-import will show the import date. The overlay sounds like your data / video is misaligned after the import. Please adjust the sync manually. To do this, select the lap to overlay, press Edit, select the row showing the video preview. More information is available in Video Documentation of www.gps-laptimer.de/documentation.